This September, members of the Syracuse University and greater Syracuse communities will relive the journeys of five of their neighbors from the Congo who are struggling to leave the past behind and form a peaceful community in Central New York. The world premiere of “Cry for Peace: Voices from the Congo,” a work commissioned by SU’s Arts Engage and written by pre-eminent playwrights Ping Chong and Kyle Bass, with Sara Zatz, will be performed on Wednesday, Sept. 12, at Syracuse Stage. The play runs through Sept. 23, with five performances dedicated for SU and SUNY College of Environmental Science and Forestry faculty, staff and students. The presenting sponsors for “Cry for Peace” are SU’s Arts Engage, Syracuse Stage and Ping Chong & Company. The five SU performances will be held at 7:30 p.m. on the following dates: Wednesday, Sept. 12; Thursday, Sept. 13; Tuesday, Sept. 18, Wednesday, Sept. 19, and Thursday, Sept. 20. Free tickets for the performances are available at the Schine Box Office; there is a limit of four tickets per person. A 30-minute talkback panel will follow each of the SU performances and feature guests who are doing Congo-related work locally and globally. Sign language interpretation will be available at the Sept. 20 performance. A five-minute preview of the play can be found here. It is recommended that show patrons be at least 16 years of age. “Cry for Peace” chronicles the lives of five people—SU alumnus Cyprien Mihigo ‘07, Emmanuel Ndeze, Beatrice Neema, Kambale Syaghuswa and Mona de Vestel—survivors and refugees from the Congolese civil war. They are members of once opposing tribes—the abductor and the violated—struggling to leave the past behind and create new lives, and a new community, here in Central New York. Their personal narratives, combined with powerful images and songs, create a rich theatrical experience that underscores the power of the human spirit. SU and Syracuse Stage have been engaged in collaboration with Chong for the past two years. He was in residence at SU last fall under the auspices of SU Arts Engage to develop a new work regarding the Congolese civil war and its impact on individuals who were forced to become refugees. This fall, Chong is the Jeannette K. Watson Distinguished Collaborator in the SU Humanities Center. Syracuse Symposium 2012: Memory-Media-Archive will sponsor the opening night performance at Syracuse Stage on Friday, Sept. 14. A talkback panel will follow that performance, featuring Mihigo; Chong; SU Humanities Center Founding Director Gregg Lambert; and Bass. Tickets for non-SU performances are $20 for the general public and $15 for Syracuse Stage subscribers and Flex Pack Holders. For more information, call the Syracuse Stage Box Office at 443-3275 or visit syracusestage.org. “Cry for Peace” is part of Undesirable Elements (UE), an ongoing series of community-specific oral history theater works by Ping Chong & Company. Created in 1992, each production focuses on a specific community, with local participants testifying to their real lives and experiences. Scripts are based on interviews with participants, who then share their stories in the final production. More than 40 UE productions have been made across the United States and abroad. 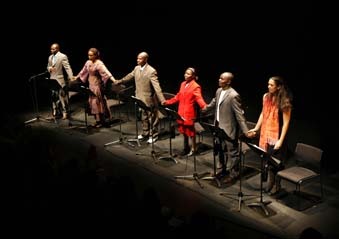 Syracuse Stage’s first UE production occurred in 2008 with “Tales from the Salt City,” marking Syracuse Stage’s first collaboration with Ping Chong & Company. Following its Syracuse run, “Cry for Peace” will move to New York City-based La MaMa E.T.C., where it will be performed in a festival celebrating the 20th anniversary of UE. The NYC performances will coincide with Congo Week, a global week of activities that commemorates the millions of lives lost in the Congo conflict while celebrating the enormous human and natural potential that exists in the country. During the run of “Cry for Peace,” original artwork by students from the Illustration Program in the Department of Art in the College of Visual and Performing Arts will be exhibited in the lobby of Syracuse Stage. “Eat Together for Peace” is part of a larger initiative at SU that explores hospitality, the arts and culture as pathways to peace and understanding. Hosted by the SU Humanities Center, a series of peace-related events will encourage SU students, faculty, staff and others in the community to eat with someone different from themselves for the purpose of mutual understanding.